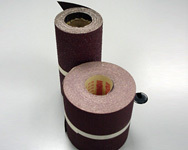 Viginia sandpaper Rolls are the ideal product for all drum-sanding machines. They can either be cut into Sheets for the drum sander or small discs for the edger. The heavy Monster tear resistant backing and specially engineered abrasive grain ensures long life and aggressive cutting action. Rolls are available in widths 200mm and 300mm all in 50m long rolls.